Dungeons and Dragons, Pokémon card games and role-playing games are more than entertainment -- they're inspiration for the CIA. David Clopper, senior collection analyst with 16 years' experience at the CIA, also serves as a game maker for the agency. From card games to board games, Clopper creates games to train CIA staffers including intelligence officers and political analysts for real-world situations. "Gaming is part of the human condition. Why not take advantage of that and incorporate into the way we learn?" Clopper said Sunday at a games-themed panel discussion at the South by Southwest Interactive technology festival. 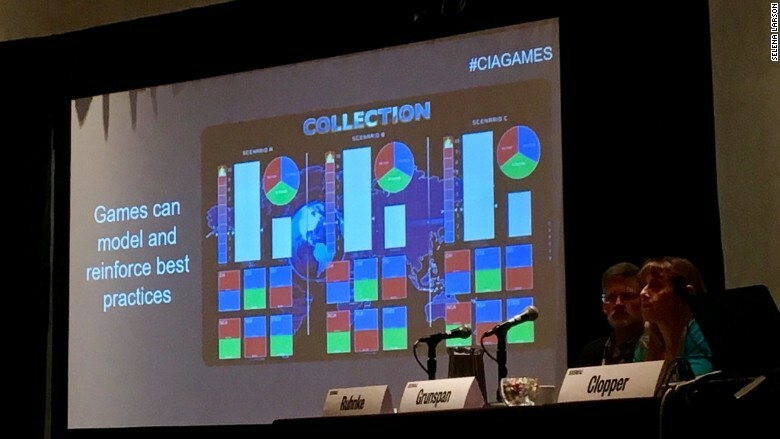 Clopper and other CIA officers discussed how the agency uses games to teach strategy, intelligence gathering and collaboration. Clopper, who began making training programs based on popular tabletop games in 2008, described some of his creations for the CIA. In "Collection," Clopper's first CIA game, teams of analysts work together to solve international crises against a ticking clock. His second title, "Collection Deck," is a Pokémon-like card game in which where each card represents either an intelligence collection strategy or a hurdle like red tape or bureaucracy. For instance, a player could lay out a card to collect intelligence via satellite photos, but an opponent could block them by playing a "ground station failure" card. It's meant to mimic situations analysts might run into in their actual work. Also speaking on the panel was Volko Ruhnke, who is an intelligence educator at the CIA and a freelance game designer. Ruhnke said he is particularly interested in one type of game: a simulation tabletop game to train analysts and help with analytic tasks. It could help forecast complex situations by forcing players to handle multiple scenarios simultaneously. Ruhnke himself created a commercial board game to simulate the Afghanistan conflict and walk players through military, political, and economic issues in the region. It gives players "a much more dynamic understanding of the issues of modern Afghanistan," Ruhnke said, adding that a similar game could be of use internally at the CIA as well. Old school games are the main inspiration for popular training programs -- for now. But analysts expect to be using virtual reality gaming in training programs soon. Multiple branches of the military have used VR training for years, immersing service members in real life experiences through visual and audio simulations. "The sooner we can get involved in using VR in games, the better," Rachel Grunspan, Chief Strategy Officer at a digital innovation organization inside the CIA, said during the panel discussion.. "You want to get their heads inside the intelligence question you're trying to answer, and VR does an amazing job doing that." Correction: A previous version of this story incorrectly referred to CIA agents instead of CIA officers.